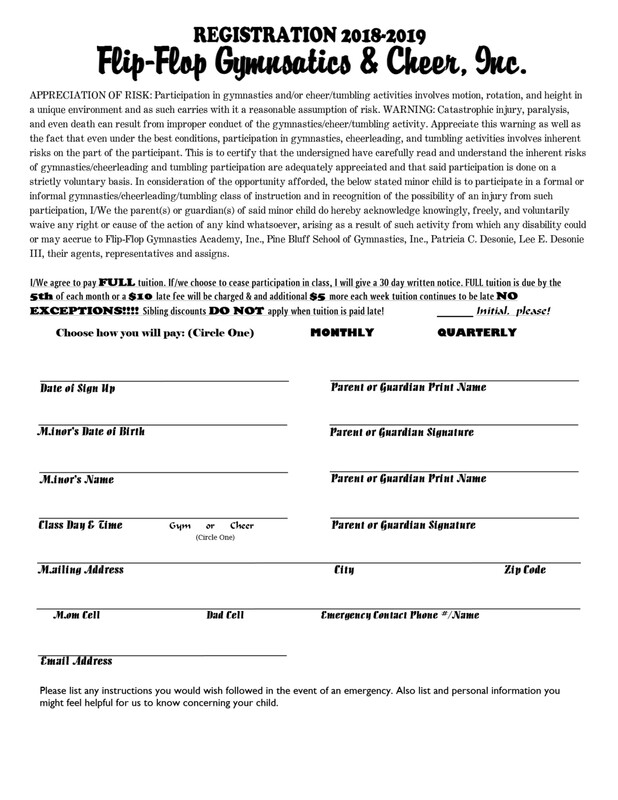 The 2018-2019 Registration Form has been updated from its original! Please download, print, and fill out completely! Once finished please mail it to us or save a stamp & drop it off along with registration and/or monthly fees! Open to All USAG Member Clubs and gymnasts! 2 FULL sets of equipment provided by NRA Gym Supply and Meet Integrity will run and score the meet for us! Please spread the word...........great facility and great awards! Let Flip-Flop host your next birthday party! Parties include a hostess to set-up, supervise and clean up. 20 party favors are included with each party as well. More information about hosted birthday parties can be found here. Looking for an evening or night without the kids. Check out the schedule for upcoming PNO. The kids play games like limbo, freeze dance, run an obstacle course and win prizes. It's great wholesome fun in a safe atmosphere. More details can be found here.